Searching for Vancouver’s best food carts? This may be one of them. La Brasserie Street food cart’s lone, titillating entrée item has sold out regularly since opening April 11. To date, its ‘fresh out’ record time is 1 p.m. — a mere two hours after beginning lunch service. 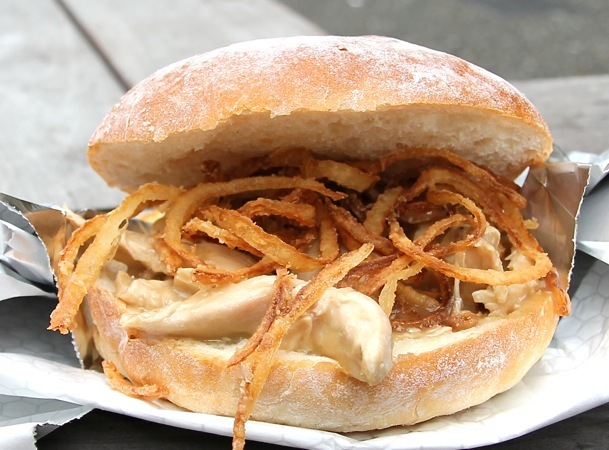 Causing the kerfuffle is a gravy-laden, beer brined chicken sandwich, aptly named, Brass Chicken Sandwich ($6.25). If its crispy fried onions were discarded, I’d run the risk of confusing the warm creation for a delicious little pillow. But the skinny, deep-fried onions cannot be omitted. They are softly sweet and addictively crunchy — perhaps a sell-out kind of side dish of their own someday? The floury buttermilk bun could’ve passed as a Portuguese and the juicy rotisserie chicken — treading in hot gravy — lacked any beer flavour. Regardless, the assemblage was the kind of thing to warm bellies on drizzly Vancouver spring days.